I've been meaning to blog about this few days after the event but like what I said on my status on my page, I found no joy in doing so because of this sad cake story. No worries, I have moved on. I realized that what matters most was we made our birthday girl very happy. R and I originally wished for an out of the country celebration for Sophia's 7th birthday - a trip to Hongkong Disneyland, specifically. Unfortunately, it all depended on my savings since all of R's salary goes to bills, everyday expenses and our girl's school fees. I only had Bebeng's Kitchen then that its earnings weren't enough for the celebration I hoped for. Good thing she chose to have a party with our families and her friends. I think it's the more practical choice that time. I picked McDonald's Celebrations since Sophia isn't really into Hello Kitty, which Jollibee has. We also like that the party place in McDonald's Sports Center branch in Marikina is separated from the restaurant. Our guests didn't have to pass by the customers to go to the venue. No unnecessary by-lookers as well. What I disliked about it, though was the broken airconditioner unit. Water continuously dripped from it that by the end of the party, there was a small puddle that almost made me slipped. 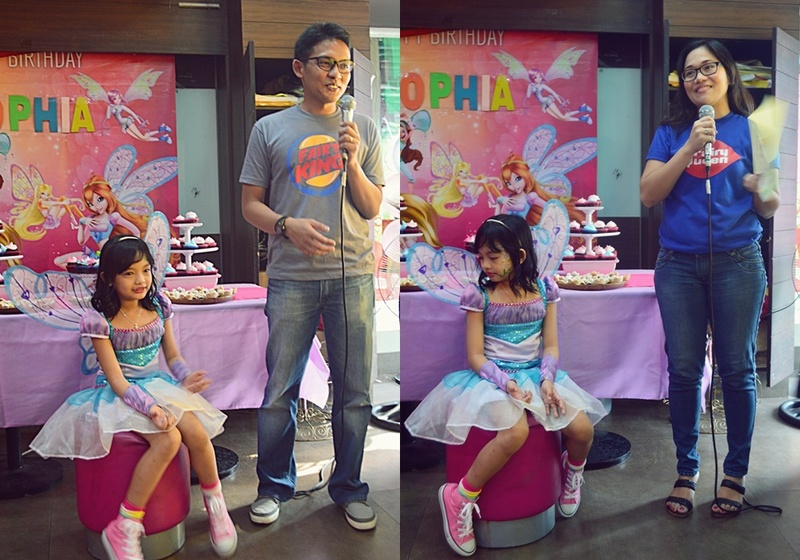 Anyway, Sophia chose the Winx Club party package. The estimated number of guests was around 60 and we paid P15,000+ for the food set that has chicken, spaghetti, burger, fries, sundae and drinks. I also hired a face painter that the McDonald's staff recommended. That guy's soooo good! He really is a great artist. He worked fast, too so the kids didn't wait that long. McDonald's has the staple red and yellow cloths for the service tables, where the loot and cakes were placed but I still went ahead and bought pink and purple fabrics from Marikina Dry Market. The party package has Happy Meal toys for all the kids. They also provided for the giveaways and prizes. I just added some candies and sweet stuff that came with the fairy flute. Sophia also chose to convert her bonus tent (you'll get that for free if you'll spend at least 12k) to more Happy Meal toys for the piñata. Said my thoughtful party girl, "so my friends will have lots of toys to bring home!" God bless her heart. My mama gave her only granddaughter a silver accessories set that Sophia lovingly wore with the costume her other grandma (my MIL) gifted. I had it made by Cheriane Collection. They are one of the best costume makers online! Then I bought her first Converse Chuck Taylors to complete the punk fairy princess look. As for my and R's shirts, we had it made by our highschool batchmate who owns Tshirt Printing Philippines; concept by me, graphic design by my super talented cousin, Valerie. For all these wonderful photos, I asked one of Sophia's teachers to take photos as I know how he enjoys doing it. You can contact him through his Instagram. Bonus: He's really good with kids! The party didn't have the best cake it should have and Birdie the mascot was too dirty for an appearance. But at least we got a purple cake and Grimace, who's purple, too. Most importantly, in my little girl's innocent eyes and pure heart, her party was the best. Glad that solo child she may be, she is not the spoiled bratty type. Truly, Sophia is my greatest blessing. FLY HIGH, MY FAIRY PRINCESS! The travel agent we got when we went to HK Disneyland last March 2017 said best time to go is between Jan to March. Aside from the fact that its not yet too hot, airfare are also less pricey as compared to April and May. Try to book around 1st week of January they have seat sale. Hi again, Royal Domesticity! Best time po pumunta ng HK, according to my relatives, is Summer (April-May) and Sembreak (October) since kids in HK have school during these months (especially if you're planning to go to Disneyland). Christmas season is okay rin kaya lang baka magka-flu kayo pagbalik ng Manila sa sobrang lamig doon (it's much colder than Baguio). Also, rains are seldom pag ganitong time rin. The only downside of going there during these times, sabi nila, is maraming Pinoy na pumupunta sa HKDL so expect niyo na maraming nagta-Tagalog, hehe. Oh! Yummy! The best place for a party like this! Fantabulous post it is! I was also planning to host one of the corporate events NYC here at McDonalds, because who doesn’t like to have those fries. Anyways, happy birthday to your daughter, I am sure she had a blast!